Moon Dog has a fondness for adding things to dark beers. OK, they have a fondness for adding things other than malt, water, hops and yeast to pretty much any beer that passes through their brewery. But, over the years, their darker beers have come laced with oak, smoke, Redskins, truffles, bugs and, well, you get the message. 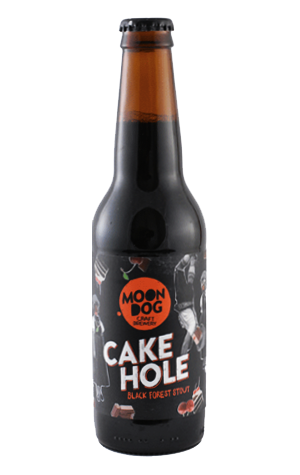 The latest is Cake Hole, the second stout to leave the brewery in quick succession, following Black Lung VII, and one tagged a Black Forest Stout in tribute to the famous, always-on-menus-in-the-1970s dessert of the same name. In looking to recreate the experience of said cake, the brewers added sour cherries, cacao and vanilla alongside a veritable who's who of specialty malts. And they ended up with a beer that's a tasty, chocolaty stout, one with a touch of drying roast and in which the sour cherries add a wee tang without being as prominent as, say, the thousands of Redskins that went into Ogden Nash a few years back.